Raja Ampat, a fin-tastic ship to a fabulous destination at a price you can't beat. 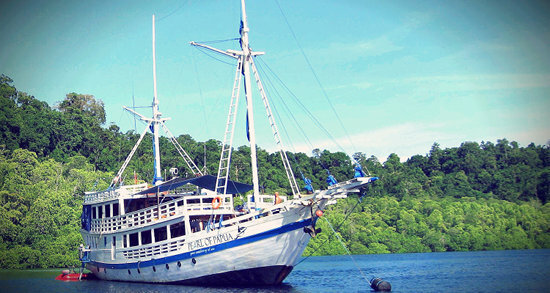 This July and August we have charters on the Pearl of Papua at 20% off. If you have not been to Raja Ampat, the center of biodiversity, now is the time to book. Contact us for space! The ship consists three decks and crafted by the highly respected and renowned boat builders of Tanah Beru in South Sulawesi. The beautiful Phinisi schooner is fitted and specifically designed for liveaboard diving cruises. The Pearl of Papua provides a huge dedicated dive-deck with gear-up stations assigned for each diver throughout the cruise. Discount dates are: July 11-18 (7 nights), July 20-30 (10 nights) and August 01-08 (7 nights). Hotel Packages include accommodation at True Blue Bay Resort; standard room, airport roundtrip transfer, daily deluxe continental breakfast buffet, all taxes and service charge. Dive Package includes 5 days of 2 CCR Morning Boat dives, 2 CCR tanks rental per day, air diluent and O2 fills, 1 bailout tank per day filled with air or Nitrox 30%, weights and all taxes. Not included, sofnolime, diluent other than air, bailout mix other than 30% nitrox, bailout regulator, helium. Packages based on per person double occupancy $1528 USD. Contact us for availability. 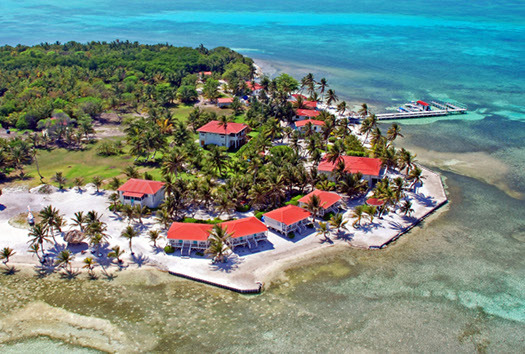 Turneffe Flats has long been recognized as one of Belize's premier saltwater fly fishing, SCUBA diving and marine ecotourism destinations. Located on the Turneffe Atoll, the largest and most diverse coral atoll in the Caribbean, the resort specializes in superior service for a limited number of guests. Awaken in your air-conditioned beachfront cabana to an incredible tropical seascape of white sand beach, expansive bonefish flats, lush mangroves and the surf breaking over the reef for miles in either direction. Watch a spectacular sunrise from your verandah and when night falls, the stars look close enough to touch. Ideally located to enjoy all of Turneffe's 250 square miles of expansive flats, coral reefs and remarkably rich marine habitat, this resort is a divers Caribbean paradise. 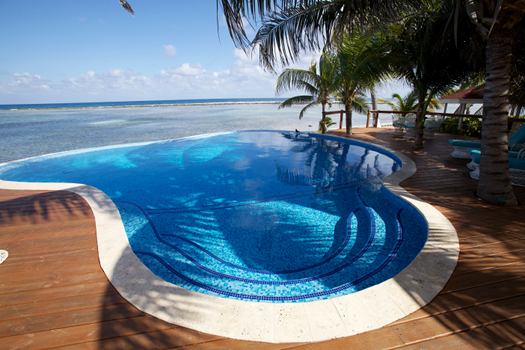 Grab your dive gear and let's head to Belize….the diving is superb, and the pool is great too! For the best wreck diving on the planet, nothing comapres to Chuuk Lagoon. Also known as Truk, but was changed to it’s original name in 1986 when the Compact of Free Association went into effect. The compact is a 15-year political relationship with the United States that started in October, 1986. Chuuk state consists of seven major island groups lying within the Eastern Caroline Islands, about 617 miles (1028 km) southeast of Guam and 3,262 miles (5,436 km) southwest of Hawaii. The total land mass of Chuuk state, including the outer islands, is approximately 77 square miles (128 km). 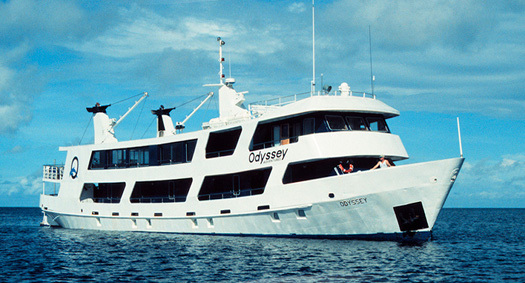 We are now offering charters on the Odyssey, Truk's finest liveaboard ship. 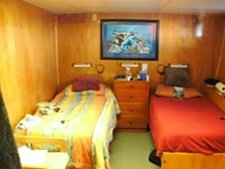 The ship offers a selection of cabins, 6 with either a king or two twin beds, 2 single cabins, and 1 cabin with a double twin bunk. 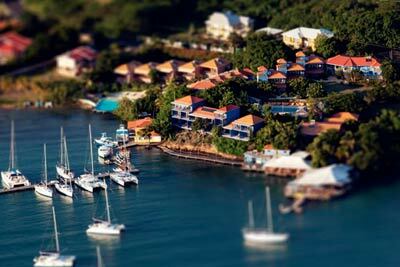 Pricing for 2014 and 2015 is $3095 per person double occupancy. Contact us for availability. Dive with Odyssey Adventures to see the ghost fleet of Truk Lagoon, the world’s best shipwreck destination. That’s only the beginning of your adventure. You’ll see an abundance of incredible tropical fish, anemones, gorgonians, and eagle rays. You'll have the option to dive at your leisure, or borrow one of our experienced local dive guides who will show you all those places you wouldn't find on your own. Join our group on the Arenui for an amazing excursion in Indonesia, cruising the waters of Komodo. This is another bucket list destination. The charter embarks in Bima and disembarks in Labuanbajo. When you enquire about our charter, ask for our agent's discount. Dates for this charter are 29 July to 09 August 2016. Email us for a detailed trip itinerary. Added Fees: Port $150; Fuel Surcharge $100; Marine Park Fee $90. Standard Inclusions: Full board accommodation in deluxe cabin; shore activities/excursions according to the program; soft drinks, water, tea, American/Balinese coffee; five meals per day, up to 4 dives/day; tanks, weights and weight belts; airport transfer; government taxes; 1/2 hour welcome massage. Standard Exclusions: administration/port clearance fee; National Parks fee; fuel surcharge; international and domestic air; hotels and meals before and after the cruise; alcoholic drinks, espresso, cappuccino; dive equipment rental; nitrox; massages and spa treatments; travel insurance; onboard purchases; private tours; laundry; on-board telecommunications; crew gratuities. This famous dive destination is located in the within the Coral Triangle, an area that boasts the world's highest marine biodiversity. Situated 200 nautical miles east of Bali in Nusa Tenggara province - in the Lesser Sunda Islands - the Komodo National Park has a total land area of 75,000 hectares and encompasses a number of islands, the largest of which is Komodo (34,000 hectares). A total of 112,500 hectares of the surrounding waters is also under the jurisdiction of the park rangers, allowing for the protection of over 1,000 species of fish and hundreds of different corals. Komodo's dive sites stretch from the warm waters of the Flores Sea in the north to the chillier waters down south in the Indian Ocean. The underwater terrain presents many contrasts, with sheer cliff walls, pinnacles, sandy flat bottoms, underwater plateaus, slopes, caves, swim-throughs and channels - all with differing colors, sizes and types of both hard and soft corals. As an example of how Komodo truly represents diving diversity, 2 popular dive sites at Gili Lawa Laut - Crystal Rock and Castle Rock - offer opportunities for critter spotting, as well as big fish action.In fact, Castle Rock offers a nice opportunity to try out a 'reef-hook' dive, as you secure yourself to the rock and float in the current, watching the schooling fish and predator/prey action! Dive at other famous sites such as Cannibal Rock, Manta Alley, Yellow Wall, Angel Reef, Torpedo Alley, Pink Beach, Unusual Suspects, Crinoid Canyon and Gazer Beach. Visit the very best that Komodo has to offer, from Pulau Moyo, Pulau Banta and Bima Bay, to Pulau Satonda and Pulau Sangean. In Moyo, you'll find spectacular corals and crystal clear waters. Banta is famed for its stunning wall dives and drop-offs, with beautiful corals covering the walls like an Andy Warhol painting. 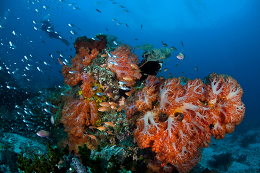 Bima Bay offers world-class muck diving with black coral covered reefs. Satonda is famous above the water for its fruit bats (which take off every sunset for a nights feeding) and below the waves for its sheltered bays and remarkable critters. Try something unique at Sangeang Island as we dive in the shadow of an active volcano, feeling the hot springs bubbling up under the black sand.h, Unusual Suspects, Crinoid Canyon and Gazer Beach. Visit the very best that Komodo has to offer, from Pulau Moyo, Pulau Banta and Bima Bay, to Pulau Satonda and Pulau Sangean. In Komodo, expect encounters with pelagics, such as manta rays, eagle rays, sharks, mola-mola (sunfish), tuna and even whales. 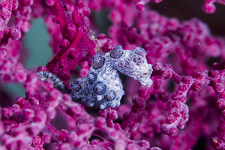 Get your macro lens ready for unusual critters such as ornate ghost pipefish, different kinds of pygmy seahorses, rare clown frogfish, weird and wonderful nudibranchs, blue-ringed octopus, pipefish, scorpion leaf fish, coleman shrimp, boxer crabs, zebra crabs. Fill your memory cards with bumphead parrotfish, napoleon wrasse, juvenile batfish, stonefish, devilfish, seahorses, dragonets, turtles, cuttlefish, banded sea-snakes, snake eels, stargazers, slipper lobsters, fire-urchins and sea-apples. Join our group on the Arenui for an end of the year celebration in Indonesia, cruising the waters of Raja Ampat. This is truly a bucket list destination. The charter embarks and disembarks in Sorong. Dates for this charter are December 12-22, 2017. When you enquire about our charter, ask for our agent's discount. Additional Fees: Fuel Surcharge $100; Port Fee $150; Marine Park Fee $120. Raja Ampat is the world's epicenter of marine biodiversity. In addition to varied corals, critters and pelagics, this destination offers vibrant and colorful underwater scenes plus also majestic landscapes, making it a perfect destination for keen photographers. The only problem with diving here, in Raja Ampat, is that you'll be so spoiled by the near-perfect conditions that you may never want to leave or dive anywhere else again. Spread across 1,500 virtually untouched islands, the waters of the Raja Ampat region are home to the most colorful, pristine and photogenic soft coral reefs, as well as a wide range of creatures from walking sharks to mantas to pygmies. Raja Ampat can boast over 1,300 reef fish, 13 marine mammals, 5 species of endangered sea turtles, 600 hard corals and 75 % of all known coral species. West of Sorong, Batanta Island will give you the chance to experience the amazing diversity of diving in Indonesia. Along the south coast are 2 incredible muck dives, where divers enjoy close encounters with all sorts of intriguing critters. At Black Beauty and Happy Ending look for tiger shrimps, ghost pipefish, mimic octopus and many nudibranchs. During the night bobbit worms, white V octopus and frogfish can be found hiding in the black sand. In the south of Raja Ampat, we dive various sites around the large island of Misool. Dive at Nudi Rock, Whale Rock, Batu Kecil, Fiabecet Corner and Kalig Ridge. Wobbegong sharks hide under colourful coral shelves and the elusive Epaulette "walking" shark comes out at night. Marvel at the overhangs and bommies of Wedding Cake. At Wayili Rock, witness large schools of batfish, trevallies and barracuda. Explore Boo Rock and Boo Point, for large Napoleon Wrasse and Green Turtles. Try out your photo skills at Boo 'windows' as dive-buddies swim through the opening in the submerged rock past a reef draped in soft corals and brimming with fish. South-east Misool is famous for the profusion of colourful soft corals and sea fans beautifully draped all over the reefs. If you're not one already, then diving in Misool will undoubtedly make you a huge fan of sea fans. Jump in at Neptune Fan Sea for a great drift dive, rushing along a gulley past giant and exquisitely-coloured gorgonian seafans. East of Misool, we visit the Wagmab area. Drop in at Edi's Cave for something a little different, as we pop up half way through the dive to take a breath inside the cave! At the Wagmab Corner dive site, look for wobbegong sharks resting under ledges or on top of cup corals. Back in central Raja Ampat, just north of Batanta (in the Gam area, south of Waigeo island), expect huge schools of fusiliers, snappers, surgeons, batfish and barracuda. Wobbegong, black tip and white tip sharks cruise the reefs here and look out for the elusive blue ring octopus creeping around the hard corals. In south-west Gam, we dive at Arborek Jetty for pipefish, cuttlefish and octopus. The fish life in this area is plentiful. The newly discovered Pontohi pygmy seahorse can be found on the coral heads and see the giant clam nestled among the pulsing soft corals. At night listen for the toad fish croaking from under the rocks. Also nearby, Manta Sandy is well-known for much bigger visitors, as it is one of the most consistent spots for finding congregating mantas. It's easy to spend a whole dive observing these majestic animals as they somersault through the water while being cleaned. If you're lucky, you'll be able to witness the unforgettable sight of a "manta train" - where a dozen or more mantas glide around and follow each other head-to-tail. Heading to the northern Raja Ampat area, we visit a pearl farm in Aljui Bay (north-west side of Weigeo), to explore underneath the main jetty for wobbegong sharks, stonefish, hundreds of schooling scads, ghost pipefish, juvenile batfish and more. Nearby, the night dive is probably the best of the whole cruise, with a chance to see velvet fish, ghost pipefish, waspfish, coconut octopus, helmut flying gunnards and even the walking shark. West of Waigeo, the rocks and seamounts in the Kawe area are truly singular as they actually sit on the equator. Kawe is one of the few places in the world where you can travel between the northern and southern hemispheres while diving! Yet, this is not the only reason to be excited about this dive. A combination of currents and feeding stations in this area combine to draw in a profuse amount of fish life, as well as huge mantas. Cruising even further to the north, we visit the Wayag area. This isolated, uninhabited area sprinkled with verdant limestone islands, bordered by slivers of white sandy beaches and palm trees, represents what people usually have in mind when they think of paradise. The only thing to rival the landscape here is the diving. It is truly spectacular, with extensive and untouched hard coral reefs. As the majority of Wayag's islands have yet to be explored, it is very likely that many more dive sites will be found in this still remote area. Returning to central Raja Ampat, we head to Dampier Strait, where nutrient-rich ocean currents create an incredible underwater environment. Everything which makes for a wonderful dive can be found here. Explore the dives sites of Cape Kri, Blue Magic, Chicken Reef, Otdima Reef, Kerupiar Island and Mioskon. Ironically, sardines are about the only reef fish not found at the site of Sardine Reef, but you won't even notice as fusiliers, surgeonfish, trevallies, rainbow runners, sweetlips and bannerfish practically block out the sky, as they swarm over a reef decorated with sea fans, soft corals and huge orange elephant ear sponges encrusted with pastel colonies of tunicates. One of the more unique thrills of this site is being able to hear "fish thunder" - the loud booming sound made when a large number of fish move rapidly through open water. The North Male Atoll is one of the most developed atolls in terms of hotel and resort development. 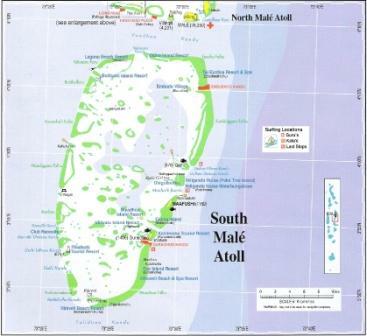 There are at least 20 resort islands operating in the North Male Atoll. It is also home to some excellent diving spots. Banana Reef was the first dive site to be discovered in the Maldives continues to be one of the most popular. The dive, which ranges in depth from 5 to 30 meters, has several interesting characteristics including a pinnacle and some overhangs. Coral formations here are prolific and colorful, attracting an extensive variety of fish, including squirrelfish, bannerfish, and oriental sweetlips. Currents can be strong at times around the reef, with occasional turbulence around the overhangs. The use of a safety sausage is recommended. Kuda Haa is a dramatic pinnacle, or thila, dive, which is widely considered one of the highlights of diving in the Maldives. Diving at Kuda Haa is at its best when the currents are not strong, when it is easy to navigate between the two parts of the pinnacle. Marine life to be expected at Kuda Haa is diverse and plentiful, including many macro species, including nudibranchs, flatworms, leaf fish, and frog fish. 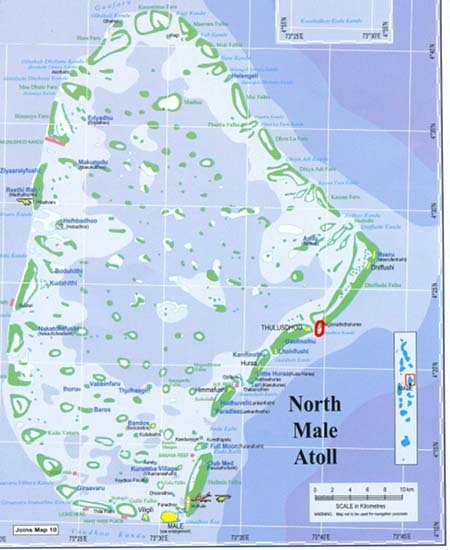 The Male Atoll is divided into two sections, the North and South. They are both located on the eastern side of the Maldives. The South Male Atoll is home to a number of tourist resorts and some of the finest scuba diving in the Maldives. Cocoa Corner is a dive site that can be explored in several different ways and with the right current and conditions, it’s is the best shark show around Male Atoll. Many dive guides consider crossing from Cocoa Corner to Kandooma Thila. With the right current, divers begin the dive from Cocoa Corner and while maintaining a depth of 25 to 29 metres, they swim across the current while parallel to the edge at 40 metres. This gives a natural reference that divers are maintaining the correct position while crossing to the Thila and divers are not taken too far inside the channel. The Thila lies in the middle of the channel about 15 metres from the channel edge. Here, divers will see schools of grey reef sharks from big mother sharks to newborn babies patrolling the edge of the channel together. Eagle rays and schooling jack fish are also common at the beginning of the Thila. By the time divers reach the Thila, their bottom time should be running out and the best thing to do is to swim to the top of the Thila and continue diving in shallower waters. A safety sausage is a must at Cocoa Corner and divers should be prepared to make an open water safety stop. Guraidhoo Kandu South is sometimes also known as Guraidhoo Corner. Currents at Guraidhoo Kandu are strong, making this a dive site appropriate for advanced, experienced divers. Gray reef sharks are common visitors at Guriadhoo Kandu when the currents are incoming, along with several pelagic species and eagle rays. Divers should be very cautious at this dive site, as the currents can pull you away from the reef and there is often underwater turbulence. Located in the western part of the Maldives Islands, the Ari Atoll is one of the largest atolls in the Maldives, and as such is home to a wide selection of dive sites. Named for a large broken rock at the center of this dive site, Broken Rock is home to a beautiful array of soft and hard coral formations that attract a wide variety of reef. There is a channel that divers can swim through, giving the dive an interesting dimension. Broken Rock varies in depth from 40 to 100 feet. Sometimes, there can be very strong currents at Broken Rock. Among the marine life often seen at Broken Rock, common sightings include the puffer fish, trigger fish, moray eels, and Napoleon wrasse. Recommended only for advanced scuba divers, the Gangehi Kandu dive site is located in the northern part of the Ari Atoll. Currents here can also be challenging, and the site should only be dived when the currents are flowing into the site. Gangehi Kandu is known as one of the best dive sites in the Maldives for spotting sharks, including gray reef sharks, white tip reef sharks and the occasional leopard shark. Coral formations at this dive site are particularly colorful, and divers here can expect to see moray eels, nudibranch, mantis shripm, and trigger fish. Large pelagic species are also frequent visitors to the site. Commonly known as Rangali Madivaru or just Madivaru, Hukrueli Faru is home to a very colorful coral reef. The site is named for the abundance of manta rays seen here (Madi means manta ray in the Maldivian language. Depths at Hukrueli Faru range from 8 to 30 meters (25 feet to 100 feet), making the dive particularly interesting and varied. Manta rays are attracted to Hukrueli Faru because of the strong currents that form a whirlpool effect in the deeper parts of the site, where they can hover over the currents. 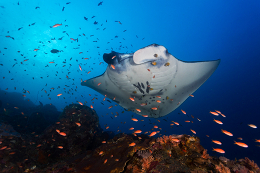 The mantas are also attracted to the cleaning stations located around Hukrueli Faru. Declared a Marine Protected Area (MPA) by the Maldivian government, Kudarah Thila is a popular dive site which enjoys many incoming currents. Coral reef formations at Kudarah Thila are bright and colorful, including a variety of soft and hard corals. Thila means “pinnacle” in Dhivehi, and at Kudarah Thila there are actually four pinnacles, which can be all visited in one dive. A swim-through at the south-east corner of the dive site makes this a particularly popular dive, as does the rich variety of marine life, which includes trumpet fish, snapper, gobies, dartfish, oriental sweetlips, and grouper. Further away from the reef, divers are likely to see gray reef sharks, napoleon fish and sea turtles. Maalhos Thila is only suitable for experienced scuba divers because the best part of the dive site lies deeper than 25 metres. Maalhos Thila is an attractive dive spot, featuring several coral heads about 28 metres below the surface, all of which are covered with beautiful corals. Common visitors to the reef here include oriental sweetlips, white tip reef sharks and blue-lined snappers. Because of the strong currents at Maalhos Thila, a safety sausage must be deployed here to ensure the divers’ safety. Maaya Thila is one of the most famous dive sites in the Maldives and is known as a great spot for both day and night dives. The marine life seen at Maaya Thila depends largely on the currents, which vary greatly; when the currents are not strong, Maaya Thila is an easy dive site, suitable for less experienced divers, but when currents are strong Maaya Thila is recommended for only advanced divers and they will need to use a safety sausage. Maaya Thila is most famous for the white tip reef sharks that can nearly always be seen here, both during the day and night. 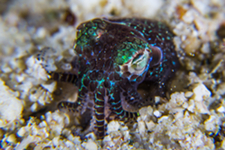 On a night dive at Maaya Thila, divers will likely encounter moray eels, turtles, octopus and stonefish. Fish Head, or Mushi Mas Mingili is one of the most popular dive sites in Maldives. Prior to the site being declared an official Marine Protected Area by the Maldivian Government it was a common shark feeding spot among scuba divers. Marine life typically seen at Mushi Mas Mingili Thila includes gray reef sharks, white tips, Napoleon wrasse, jacks and tuna. Kalhahandi Kandu has earned the nickname Pannettone from the many Italian divers who believe it resembles the traditional Italian fruitcake. 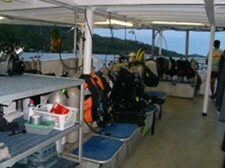 It is an attractive dive site, recommended mainly for advanced scuba divers, except for when the currents are not strong. There are some spectacular coral formations here, featuring a variety of soft and hard coral species, which attract a wide selection of fish including angelfish, basslets, butterfly fish, scorpion fish, trigger fish and puffer fish. The corals here are in good condition and weather conditions at Pannettone mean the dive site can be explored year-round. The Maldives, an island republic with more than 1,000 islands and atolls offers scuba dives amazing dive experiences. The multitude of dive sites owe their abundance of marine life to the nutrient-rich currents that feed the coral reefs. 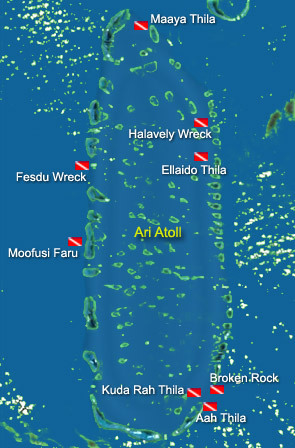 The channels between the islands and atolls can create strong currents that besides feeding nutrients to the marine environment, offer challenging drift dives along the reef walls. Other dive sites offer underwater pinnacles and protected lagoons offer calm areas that thrive with marine life. The Maldives is an underwater photographers paradise. Macro critters are in abundance and for those who love encounters with large pelagics, sharks, whale sharks, grouper, eagle rays and mantas, and Napoleon wrasse are found. Shark species include tigers, hammerheads, and threshers. 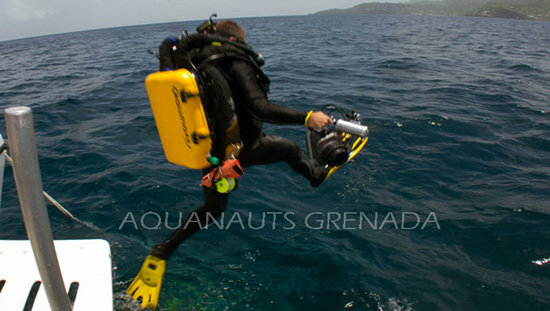 Visibility is usually 20-40 meters (65-130 feet) and water temperatures range between 23-26 degrees C (78-84 degrees F). Dive conditions are excellent all year but November thru May are out of the summer monsoon season. 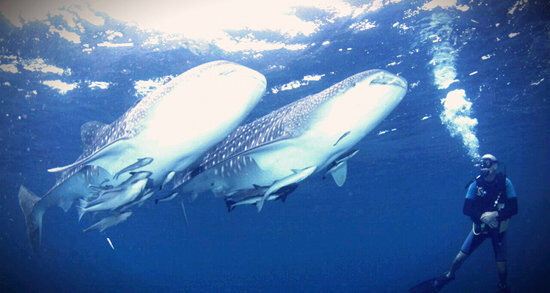 Many of the dive sites throughout the Maldives are marine protected areas. Africa offers both amazing diving and the opportunity to visit wilderness reserves. Mozambique is the gateway to both worlds. Location, location, location. If you are looking for a beautiful and comfortable place to stay just a stone’s throw from the Indian Ocean and to enjoy a private beach area with deck chair, sofas and parasols, then look no further. Casa na Praia is located in arguably the best spot on Tofo the only one really on the beach. Nestled in the corner of the bay close enough to walk to local amenities but far enough away to feel private, it is the perfect escape from the realities of everyday life. Casa na Praia is comprised of two properties, Casa Azul and Bungalow Africano. Casa Azul offers comfortable rooms full of charm. Bungalow Africano with higher standards is a mixture of modern luxury and traditional design. Casa Azul is an old colonial building lovingly restored and refurbished. It is of historical importance to Tofo as it was one of the first houses built here. Casa Azul has 4 rooms, the most loved of which is known as the Tree House and offers quirky space with a large veranda and views to die for. The other property is Bulgalow Africano. The brand new rooms are stylishly decorated and have panoramic views of the beach. Finished to higher standards, these rooms are available with AC and feature hammocks to relax and enjoy the crystal clear ocean. The room rates do not include dive packages but these can be added.